This range check error would pop up when System Five first starts, or when you try to synchronise from within System Five. 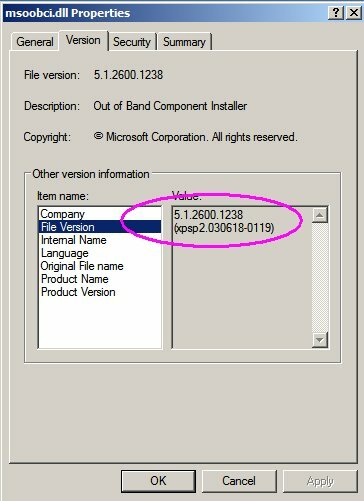 At this point the issue has only occurred when client upgraded from version 5.35.x.x to version 5.42.x.x, and running Pervasive 2000i. However this issue may also affect other clients running different versions of System Five and Pervasive. The issue is not caused by System Five, but is actually caused by non System Five files being installed into the “bin” folder, which is the program folder for System Five. This folder should not contain any files other than those required by System Five to run. In one case we determined that the problem was with a file in the folder that belonged to Microsoft Media Player. The Source (Server) and Target (Client) folders contained a file that is not part of System Five and happened to have a strange non-conforming File Version attribute. The file named msoobci.dll is part of the Windows Media Player update for versions 7.1 and 8.0. The file Version information looks like this: 5.1.2600.1238 (xpsp2.030618-0119). All of the information inside the brackets and the brackets themselves were the cause of the problem. Why this file was in the Source bin folder is very difficult to determine. The simple solution would be to just remove the problem file. In each circumstance the file causing the problem was msoobci.dll. As explained above it is a Windows Media Player update for versions 7.1 and 8.0. Go to the bin folder on the server and rather than deleting it, move it to another folder such as the system five folder. 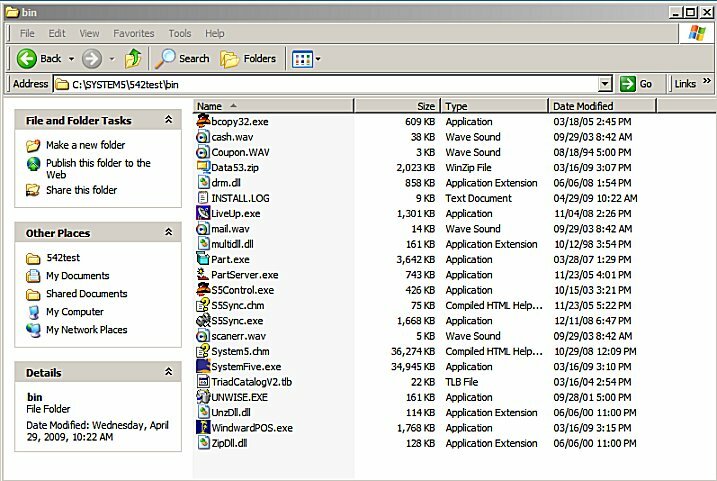 You will probably need to find it in the bin folder on each workstation as well, and move it to the work-station's System Five folder. Then re-test the synchronization utility. On the server, you will need to create a Misc folder, then move all files that are not part of a clean install of System Five into that folder. Preferably within the bin folder, in case any of those files are needed by another add in application for system five. DO NOT DELETE THE FILES. You may need them later, if other issues arise. This is an example of the files required by version 9.42.0.92 of System Five. No other files should be required. Next you will want to confirm that System Five is functioning correctly on the server. On the workstation rename the local bin folder BinBad or BinOld. Any name other than bin. Then run the s5sync.exe from the bin on the server to recreate the bin on the local drive, and synchronize the correct files from the server to the local workstation. This was done to create a clean install of the System Five program files, and to ensure that any files from the workstations do not get synchronized back to the new clean install on the server. Test on the workstation by starting System Five, and under Utilities on the top menu bar run Synchronize With File Server. The problem should now be resolved. If everything tests OK, you can repeat the process on the rest of the workstations.